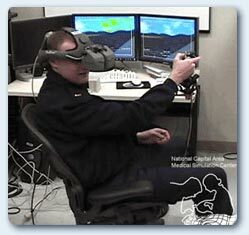 Since the head mounted display and joystick are tethered, the individual's range of physical motion is limited. Alternative methods for going between places in the virtual environment must be developed. 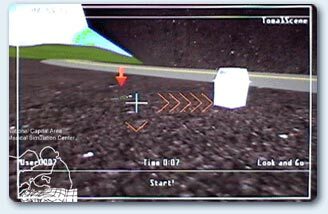 A locomotion paradigm is a method for moving around in the virtual environment. Locomotion paradigms are typically designed to be easily understood or learned. An important factor is evaluating the ease in which users can interact and move around using different paradigms. We have ported software for the TOUCH/Flatland environment from Linux to Windows. A series of experiments have been designed to evaluate different locomotion paradigms. 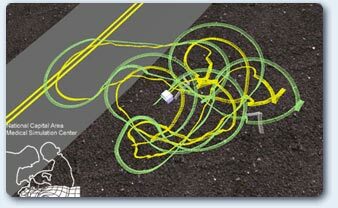 Each experiment requires the user to navigate a series of waypoints in a simplified virtual environment. The intent is to determine conditions under which one paradigm performs better (or worse) than another. This work is supported by the U.S. Army Medical Research and Materiel Command under Contract No. W81XWH-04-1-0875. The views, opinions and/or findings contained in this report are those of the author(s) and should not be construed as an official Department of the Army position, policy or decision unless so designated by other documentation.